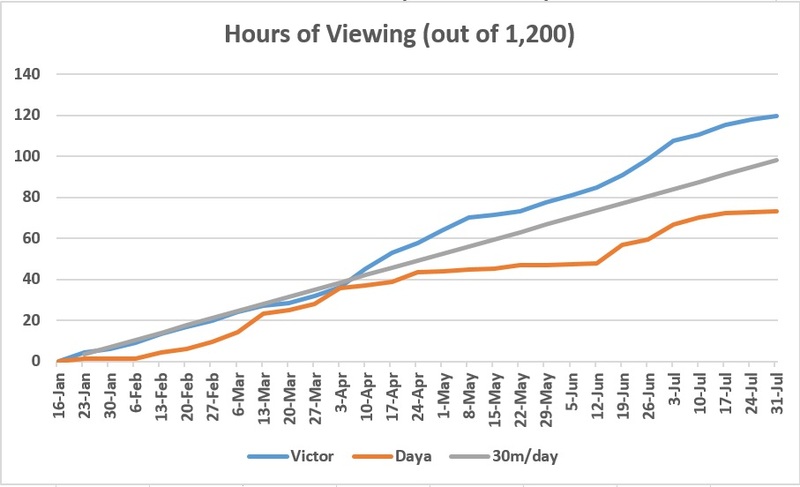 I have completed 120 hours of viewing, or 10% of the total time planned for this experiment. I have averaged 36.5 minutes a day, above the minimum 30 minutes daily that I had planned. My daughter, Camila Daya, has averaged 22.5 minutes daily, for a total of 74.7 hours thus far. I have followed my proposed methodology fairly rigorously, learning exclusively through video sources, but in some cases making flexible interpretations of my self-imposed rules, as explained in the posts from Weeks 13 and 25. The most important interpretation is that I have deemed it acceptable to use English-language subtitles with Chinese movies, though I have begun and will continue gradually to reduce their use when repeating a movie. Have these 120 hours of viewing over six-and-a-half months given me any insight into my hypothesis? To answer that question, I would recall that my experiment actually has three related hypotheses. The first and main hypothesis is that I can learn to understand Mandarin just by watching authentic videos. The second—and perhaps most difficult to prove—is that this method is actually efficient and effective as compared to more traditional methods. The third hypothesis is that after watching 1,200 hours of authentic Mandarin videos, I will have attained sufficient comprehension that I can tackle a new video, and on first viewing, understand the general plot or the topics that are being discussed. To the first and primary hypothesis, I feel more strongly than before that the answer will be a clear “YES!” There are times that I feel I am getting nowhere and that Chinese is undecipherable! Yet I have deciphered and begun to learn at least a couple hundred words, and my ability to pick out new words is accelerating, if ever so slowly. Though I am very, very far from my goal of understanding Mandarin, it seems very clear to me that, sooner or later, I will get there. It will take a long time. It will be arduous at times. However, if I stick with it, month after month and year after year, I will eventually understand Mandarin quite well. I will eventually be able to download a brand-new Mandarin movie, or watch a newscast, and understand it immediately, without subtitles. At that point, I will be able to go to Beijing and understand what people are saying in the street. I feel that I have not gained much insight into the second hypothesis yet. If anything, however, I feel slightly less confident about it than at the beginning of the experiment. Actually, it would be more accurate to say that while strictly speaking, I still believe this second hypothesis may be proved correct, since the methodology may be shown to be effective “as compared to the traditional methods,” I believe that doing something very similar to my experiment, but with guidance, would be even better. Although I am generally an advocate of combining the four language skills, I think there are definitely advantages to focusing on listening for the first few hundred hours in the case of a radically foreign language, such as Mandarin in the case of an English speaker. I believe that, experiments aside, watching the amazing original Chinese movies I have seen would be a fantastic way for any new learner to begin tackling Mandarin, but ideally with an added component of guidance—something along the following lines. Before watching the entire movie, the students would practice, with a native-speaking teacher or even a self-study guide, 50 or 100 new terms in Mandarin. Translation should be avoided as much as possible (but a little might be necessary in the very beginning). Images and, best of all, snippets of the actual movie or of other videos could be used in a didactic way to introduce and reinforce these terms. After an hour or two of practicing the new terms—and ideally actually reproducing them and getting feedback from a native speaker—the students would then watch the entire movie. They would hear the terms they practiced many times, in context. After a first viewing, they would go back to their guidance, reviewing terms, pronunciation, and snippets. Then they would watch the movie again, and depending on their preferences, watch it several more times in subsequent weeks and months, occasionally referring back to the guidance. Finally, as to the third hypothesis, which is that 1,200 hours will be enough to attain an intermediate level of comprehension: it is too early to tell, but I am insecure about it. If I take what I understand now and try simply to multiply by 10, or better project my current pace into the future, it seems I will not get there. I have learned many of the most common words, which show up most commonly in any conversation, so the new words I learn now do not make such a large dent in my estimated percentage of total comprehension. 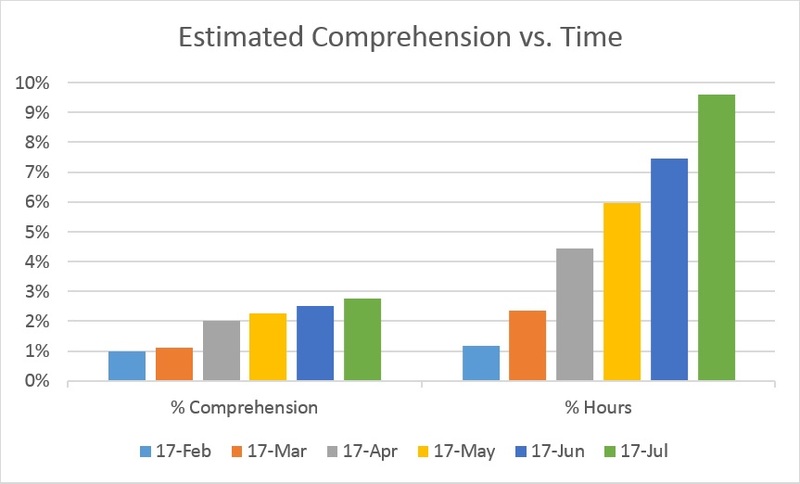 Since April, it seems my comprehension has been increasing by about 1% every 4 months. If that rate continues, in five more years I would still understand less than 20% of natural Mandarin dialogue. However, there are other factors to consider. One is the more subtle neurological adaptation that I mentioned in my early posts. I am, bit by bit, becoming more familiar with the phonemes and the cadence of Mandarin. I hope this increasing familiarity will bear greater fruits later on. Second, my acquisition of terminology is not likely to be linear. I believe that as I understand more, I will be able to pick up new words at an accelerating rate. If you have ever put together a 10,000-piece puzzle, I believe it may provide an apt analogy. In my puzzle-building strategy, you first find the corners and start separating the edge pieces. These initial successes provide a sense of accomplishment. It would be akin to learning wo, ni, hao, shi, de, and shie shie in the first weeks of Mandarin. Though you don’t really understand any dialogue yet, you can certainly pick out a lot of wo’s, and that feels like progress! Then, the slow and grueling part of the puzzle making begins. All the tiny pieces look so similar. You have no idea where any of them go, and you can hardly begin to put any together. Bit by bit, though—often by trial and error or some lucky break—you make matches and the puzzle begins to take form. That is where I currently am in my Mandarin experiment, and where I expect to be for a few months, if not years. When you complete all the edges and parts of puzzle’s interior scenery begin to take shape, your pace picks up quite a bit. You can easily tell where certain pieces fit. You are moving fast and progress is visible on a daily basis. It is a 10,000-piece puzzle, so it’s still a challenge and requires a good deal of patience. But there is no longer any doubt that you will finish, and you can already project about how long it will take. That is where I hope to get before my experiment is finished. The final phase is when you have completed most of the puzzle and are just filling in holes. That period is truly fast-paced and fun. I certainly don’t expect to get to that phase within my 1,200 hours, but it is something to look forward to eventually. Importantly, I am enjoying my experiment and continue to feel motivated. I have found good sources, especially Qiao Hu, quality original Chinese movies, and Disney movies in Mandarin. I have set aside sources I don’t like as much, such as Pleasant Goat, low-quality TV dramas and older, low-quality movies, in addition to a source I Iiked quite a bit, but that was too difficult—Boonie Bears. I have been very regular about this blog, have had a few appreciative readers, and hits in general have been ticking up very slightly. The most interesting aspect has been that people have accessed from all parts of the globe, which I will write about in the near future. I hope the remaining 90% of my experiment will be as enjoyable, and even more productive, than the 10% that is already past. I guess I’d have to say that I believe you will accomplish your goals because I think your learning will speed up incrementally. I like your puzzle analogy. On the other hand, I suspect that not many people would have the discipline or the desire to learn a language this way because it seems arduous and lonely. Maybe some kind of combination such as you suggest where some guidance is added, perhaps with a group of learners, would make it seem more accessible. I appreciate your faith in my ability to reach my Mandarin comprehension goals! Not to mention your regular readership! I agree that many people would not have the discipline or the motivation to learn a foreign language by themselves, and especially such a difficult one, without an immediate necessity. In addition, most people prefer a well established path than blazing a new one. Most people would not believe that they could learn this way. That said, among self-study approaches, I think that a video method is actually less arduous, boring, and even lonely that a traditional method involving a great deal of memorization and repetition, or the use of software and pre-packaged courses. As you know, I find a lot of the movies highly enjoyable! I am thinking that when I am all finished, I might prepare a Mandarin-learning method and try to market it! The idea would be to unite the (potential) effectiveness and enjoyability of my authentic-video-learning method with a structured approach that provides detailed guidance.